Big Boy Blanket – #5 Firefighter! 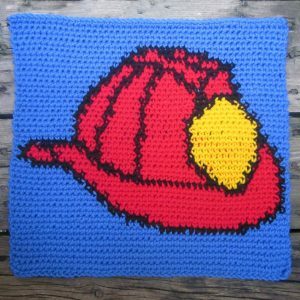 Our 5th square of the Big Boy Blanket is a bold, red firefighter’s helmet! 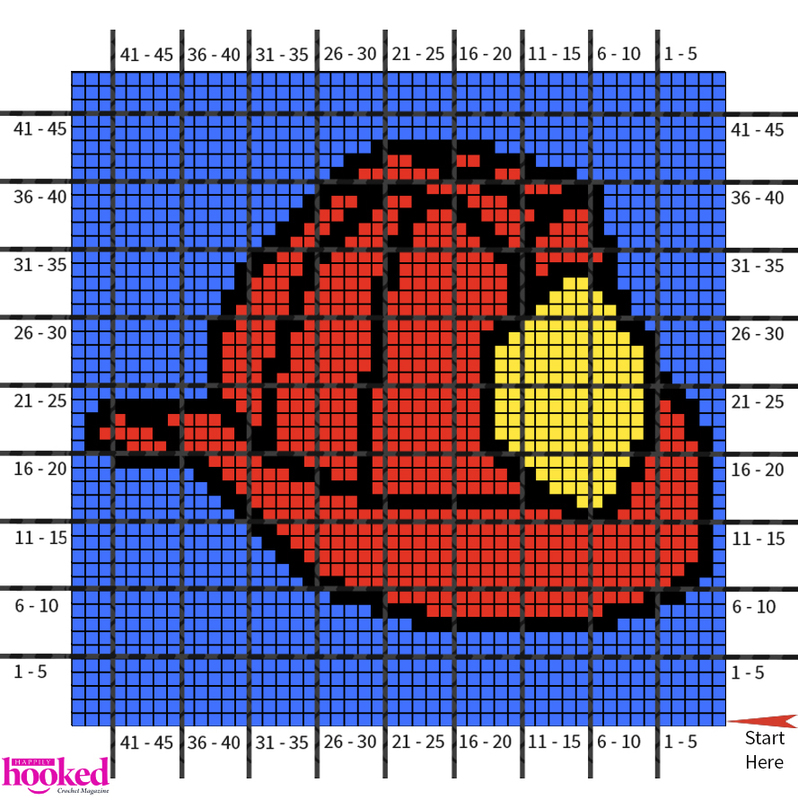 Little ones sure do love fire trucks, and they’ll love this hat square, too! 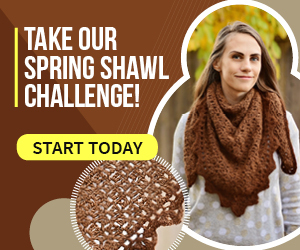 Have fun with this block and don’t forget to share your progress on Social Media with the hashtag #HappilyHooked! If you missed the first 4, you can find the Rocket square here, the Sports square here, the Lion square here, and the Car square here. Yarn: Worsted weight yarn: 1 skein each of Blue (A), Black (B), Red (C), Yellow (D). Ch 1 and turn at the end of each row. Does not count as a st. Begin Row 1 by working 1st sc in 2nd ch from hook. Follow written instructions or see color chart on last page. Rows 1–7: With A, sc 48. Row 8: With A, sc 25. With B, sc 15. With A, sc 8. Row 9: With A, sc 5. With B, sc 4. With C, sc 13. With B, sc 4. With A, sc 22. Row 10: With A, sc 19. With B, sc 4. With C, sc 19. With B, sc 3. With A, sc 3. Row 11: With A, sc 2. With B, sc 2. With C, sc 24. With B, sc 3. With A, sc 17. Row 12: With A, sc 16. With B, sc 2. With C, sc 27. With B, sc 2. With A, sc 1. Row 13: With A, sc 1. With B, sc 1. With C, sc 29. With B, sc 2. With A, sc 15. Row 14: With A, sc 14. With B, sc 2. With C, sc 30. With B, sc 1. With A, sc 1. Row 15: With A, sc 1. With B, sc 1. With C, sc 31. With B, sc 2. With A, sc 13. Row 16: With A, sc 12. With B, sc 2. With C, sc 22. With B, sc 4. With C, sc 6. With B, sc 1. With A, sc 1. Row 17: With A, sc 1. With B, sc 1. With C, sc 5. With B, sc 2. With D, sc 2. With B, sc 16. With C, sc 8. With B, sc 2. With A, sc 11. Row 18: With A, sc 10. With B, sc 2. With C, sc 6. With B, sc 4. With C, sc 11. With B, sc 2. With D, sc 5. With B, sc 1. With C, sc 5. With B, sc 1. With A, sc 1. Row 19: With A, sc 1. With B, sc 1. With C, sc 4. With B, sc 2. With D, sc 6. With B, sc 2. With C, sc 10. With B, sc 1. With C, sc 2. With B, sc 3. With C, sc 5. With B, sc 2. With A, sc 9. Row 20: With A, sc 3. With B, sc 7. With C, sc 4. With B, sc 3. With C, sc 4. With B, sc 1. With C, sc 9. With B, sc 2. With D, sc 8. With B, sc 1. With C, sc 4. With B, sc 1. With A, sc 1. Row 21: With A, sc 1. With B, sc 1. With C, sc 3. With B, sc 2. With D, sc 9. With B, sc 2. With C, sc 8. With B, sc 1. With C, sc 6. With B, sc 2. With C, sc 5. With B, sc 1. With C, sc 3. With B, sc 3. With A, sc 1. Row 22: With A, sc 1. With B, sc 1. With C, sc 4. With B, sc 2. With C, sc 4. With B, sc 3. With C, sc 6. With B, sc 1. With C, sc 8. With B, sc 1. With D, sc 11. With B, sc 1. With C, sc 2. With B, sc 2. With A, sc 1. Row 23: With A, sc 2. With B, sc 1. With C, sc 2. With B, sc 1. With D, sc 11. With B, sc 1. With C, sc 8. With B, sc 1. With C, sc 6. With B, sc 1. With C, sc 1. With B, sc 2. With C, sc 4. With B, sc 3. With C, sc 1. With B, sc 2. With A, sc 1. Row 24: With A, sc 2. With B, sc 10. With C, sc 2. With B, sc 1. With C, sc 6. With B, sc 1. With C, sc 8. With B, sc 1. With D, sc 11. With B, sc 1. With C, sc 1. With B, sc 2. With A, sc 2. Row 25: With A, sc 3. With B, sc 3. With D, sc 11. With B, sc 1. With C, sc 8. With B, sc 1. With C, sc 6. With B, sc 1. With C, sc 3. With B, sc 1. With A, sc 10. Row 26: With A, sc 10. With B, sc 1. With C, sc 3. With B, sc 1. With C, sc 6. With B, sc 2. With C, sc 7. With B, sc 1. With D, sc 11. With B, sc 2. With A, sc 4. Row 27: With A, sc 5. With B, sc 1. With D, sc 11. With B, sc 1. With C, sc 7. With B, sc 1. With C, sc 6. With B, sc 2. With C, sc 3. With B, sc 1. With A, sc 10. Row 28: With A, sc 10. With B, sc 1. With C, sc 4. With B, sc 1. With C, sc 6. With B, sc 1. With C, sc 7. With B, sc 1. With D, sc 11. With B, sc 1. With A, sc 5. Row 29: With A, sc 5. With B, sc 2. With D, sc 9. With B, sc 2. With C, sc 7. With B, sc 1. With C, sc 6. With B, sc 1. With C, sc 4. With B, sc 1. With A, sc 10. Row 30: With A, sc 10. With B, sc 2. With C, sc 3. With B, sc 2. With C, sc 5. With B, sc 1. With C, sc 8. With B, sc 2. With D, sc 7. With B, sc 2. With A, sc 6. Row 31: With A, sc 7. With B, sc 1. With D, sc 6. With B, sc 2. With C, sc 9. With B, sc 1. With C, sc 5. With B, sc 1. With C, sc 4. With B, sc 1. With A, sc 11. Row 32: With A, sc 11. With B, sc 2. With C, sc 3. With B, sc 1. With C, sc 5. With B, sc 1. With C, sc 9. With B, sc 3. With D, sc 4. With B, sc 2. With A, sc 7. Row 33: With A, sc 8. With B, sc 2. With D, sc 2. With B, sc 4. With C, sc 8. With B, sc 2. With C, sc 4. With B, sc 2. With C, sc 3. With B, sc 1. With A, sc 12. Row 34: With A, sc 12. With B, sc 2. With C, sc 3. With B, sc 1. With C, sc 5. With B, sc 1. With C, sc 8. With B, sc 2. With C, sc 1. With B, sc 5. With A, sc 8. Row 35: With A, sc 8. With B, sc 1. With C, sc 5. With B, sc 3. With C, sc 7. With B, sc 1. With C, sc 4. With B, sc 2. With C, sc 2. With B, sc 2. With A, sc 13. Row 36: With A, sc 14. With B, sc 2. With C, sc 2. With B, sc 2. With C, sc 3. With B, sc 2. With C, sc 5. With B, sc 2. With C, sc 1. With B, sc 1. With C, sc 4. With B, sc 2. With A, sc 8. Row 37: With A, sc 9. With B, sc 1. With C, sc 3. With B, sc 2. With C, sc 2. With B, sc 2. With C, sc 4. With B, sc 1. With C, sc 3. With B, sc 2. With C, sc 2. With B, sc 2. With A, sc 15. Row 38: With A, sc 16. With B, sc 2. With C, sc 2. With B, sc 2. With C, sc 2. With B, sc 2. With C, sc 2. With B, sc 2. With C, sc 4. With B, sc 2. With C, sc 2. With B, sc 1. With A, sc 9. Row 39: With A, sc 9. With B, sc 7. With C, sc 3. With B, sc 4. With C, sc 2. With B, sc 2. With C, sc 2. With B, sc 2. With A, sc 17. Row 40: With A, sc 18. With B, sc 8. With C, sc 4. With B, sc 3. With C, sc 3. With B, sc 3. With A, sc 9. Row 41: With A, sc 11. With B, sc 4. With C, sc 2. With B, sc 4. With C, sc 6. With B, sc 2. With A, sc 19. Row 42: With A, sc 20. With B, sc 3. With C, sc 2. With B, sc 3. With C, sc 2. With B, sc 4. With A, sc 14. Row 43: With A, sc 17. With B, sc 9. With A, sc 22. Finishing: Fasten off and weave in all ends. Block square if desired. Bates vs Boye Hooks…Which Should You Use? 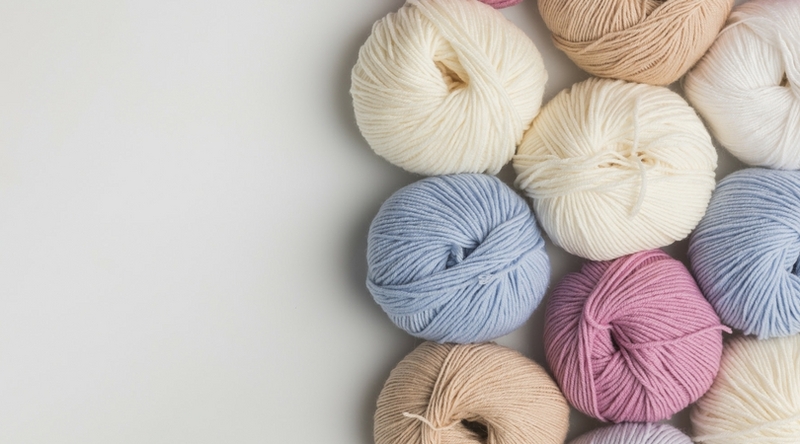 UPDATED: Are Crochet Hooks Allowed on Planes? 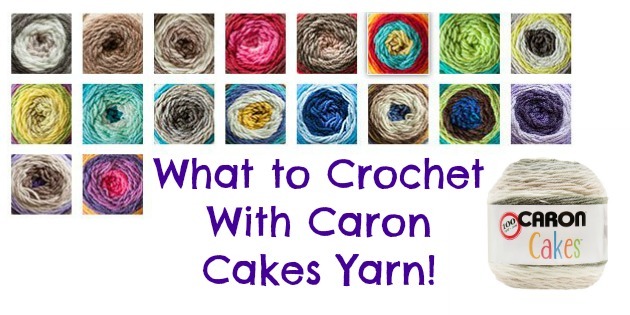 What to Crochet With Caron Cakes Yarn! 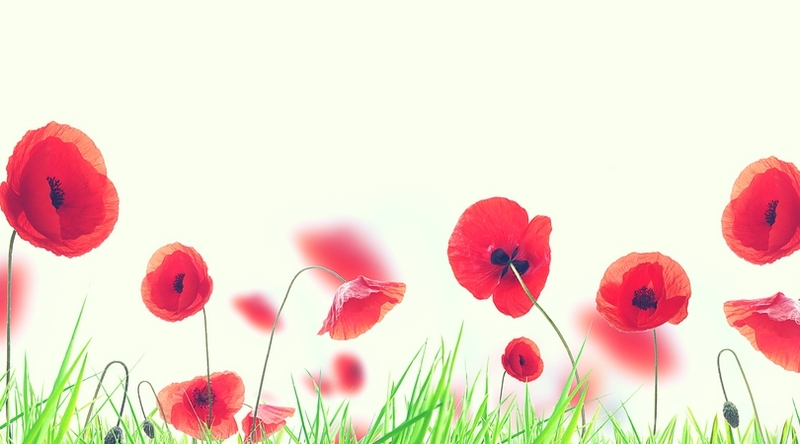 Like This & Want More? 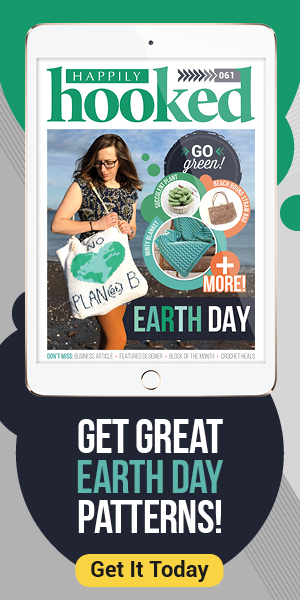 Enter your email address and you'll join 70,000 other crocheters getting FREE updates, patterns, and giveaways that are sure to knock your hooks off.